In an article in this journal in August of last year, the author reported that the second heptachloro-1,4-dioxane isomer (I), the one from m p 122oC, described in the 50s does notexist (1), as proved by numerous experiments by our working group in 1947 - 88 (2): preparation of 1,4-dioxane and Cl-substituted dioxane chlorinations (Tab 1) began in 1947 (3.4). On the strength of it there were several questions, in particular about the significance of this result in which 40 years of experimental have been invested (2,3). ANSWER: Isolating two I-isomers melting at 57 and 122oC would have meant that there would for the first time have been two chair configurations in a conversion relationship to one another, seperated in substance: a case of isomerism of a chair configuration pair whose partners are present as crystals. The theoretically possible I-isomers are formulated in fig. 1 (1.9). We have been interested in such cases of isomerism since 1947 (3)). Only after many years of effort did the author suceeded in experimentally proving such an isomerism (5a) by synthesizing two monofluoro-endecachloro-cyclohexane (II) isomers separated in substance . The constitution and configuration of II were proved jointly with Prof Y Morino of Tokyo at the time (6): formulation of this isomerism case in Fig 2. In an assumed conversion of the 1,4-dioxane-5 chair, in which eg the C-atoms 2 and 6 and the O-atom 4 migrate down and the C-atoms 3 and 5 and the O-atom 1 up, two configurations of 1,4-dioxane substitution products change into each other, which we combine to a chair configuration pair. The pair's original configuration is known as the "body", the converted one as the "antibody". In the case of 2.2.3.3.5.5.6-heptachloro-1,4-dioxane (I), the body's configuration is 6a(H)2ea3ea5ea6e(Cl) and that of the "antibody" 6e(H)2ea3ea5ea6a(Cl), ie all the e-bonded substituents change into a-bonded ones on conversion, and vice versa [e for equatorial, a for axial (9,10)]. In the case of monofluoro-endecachloro-cyclohexane, the body's configuration is 1e(F)1a2ea3ea4ea5ea6ea(Cl) and the antibody's 1a(F)1e2ae3ae4ae5ae6ae(Cl), ie all the e-bonded substituents change into a-bonded ones on conversion, and vice versa: Diag 2. 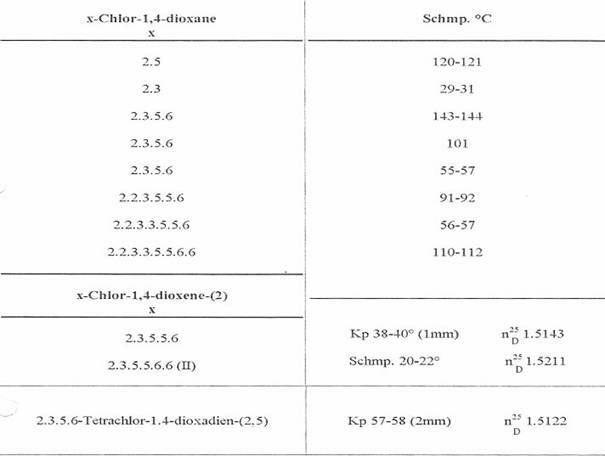 For energetic reasons there was no great probability of two heptachloro-1,4-dioxane isomers, C4HO2Cl7, existing as the two conversion partners differ by one Cl-H position [mol wts in ratio 35.5:1]. The case of monofluoro-endecachloro-cyclohexane, C6Cl11F, we realized - prepared in various ways [(5) and PROJECT II 6 (10)] - is energetically more favourable: difference in Cl-F position [mol wts in ratio 35.5 : 19]. As it was a question of a professorial thesis that erroneously described the case of isomerism concerned, immediate official objections and steps on the part of the author would certainly have had consequences for the "discoverer", particularly he (7) was not able to deliver the I-isomer from m p 122oC on request. We did not want to become involved immediately and only to publish after concluding our own experiments. It was also a question of not exposing Prof Freudenberg, the principal referee for the professorial thesis. Tab 1 (3). It seemed improbable, after our extensive experience in the field of Cl-substituted cyclohexanes, that a symmetrically built III (dipole moment: 0) would melt at a lower temperature than a I-isomer. Reference to a discussion following a lecture at the Innsbruck Chemists Congress on 01 Apr 53 at (8). The search for a second I-isomer, begun in 1947, led to examining the chemical behaviour of the I isomer from 57oC more closely, eg HCl splitting off from I from 57oC led to 2,3,5,5,6,6-hexachloro-1,4-dioxene from m p 20-22oC and this in its turn opened up new paths for getting to Cl-F substituted dioxanes and dioxenes: Tab 2 (11,12,14). The isomerism of monofluoro-heptachloro-1,4-dioxane (IV) was included in the experiments in the investigation described above, its theoretically possible chair configurations are also represented in Fig 1, read there: F instead of H. Here too, however, we only succeeded in isolating and identifying one isomer - as with I - in 1954 [1964-72 (13a,b)]. Details of the insecticidal activity of some halogenated 1,4-dioxanes in Tab 3 (14). K Hayduk and M Lüdecke [Z Naturforschg 11 B 383 (1954)] concerned themselves with the "physical factors of the action of heptachlorodioxane on Drosophila", but without characterizing the product more closely: no details of melting point, no reference to "isomers". x) Contact poison test apparatus II (10): Avoiding respiratory poison action by a current of air stream flowing from top to bottom through closed sintered-glass suction filters in parallel. Insects and test substances: in each filter there were 30 Calandra granaria on filter disks containing the substances for testing (applied in acetone solution of defined concentration, dried on pin stands). The halo com-pounds in Tab 1, 2 not listed in this table proved ineffective in these conditions. Despite the most intensive efforts, it proved impossible to isolate a second heptachloro-1,4-dioxane isomer by the time the manuscript was written, or indeed later. The non-existence of so-called heptachlorodioxane from m p 122oC was also confirmed by this independent institution. Ms, 12 p, 1976. Experiments from the Central Inst of Chem, Univ Fed of Santa Maria (UFSM), S Maria, RG, Brazil. The long-term chlorinations were conducted in Carius (bomb) tubes that were exposed to sunlight on the institute roof for up to two years. Of 300 tubes, some 180 were lost through explosion. Such experiments were no longer possible in Germany after 1969. "Cl- and F-substituted 1,4-dioxanes, -dioxenes and -dioxadienes"
Tables 1,2, and 3 were presented as slides during the lecture and then distributed subsequent to it. 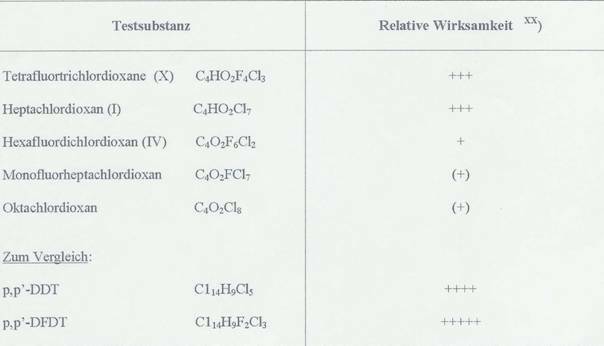 From the lecture: The most important halo compounds synthesized by us, which can be derived from 1,4-dioxane and its unsaturated forms, are listed in the said tables. Here, too, we considered the topic "Constitution (configuration) and action". 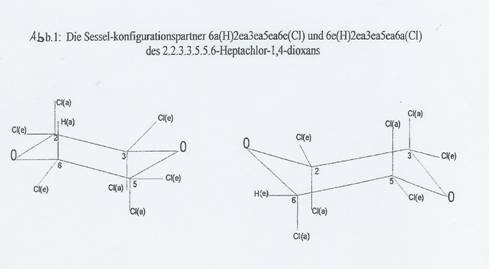 But only a few of the forms based on the dioxane chair model displayed any contact-insecticidal activity at all, and than only moderately, viz the supersubstituted compounds: heptachlorodioxane and fluorohexachlorodioxane and very weak action the octachloro-substituted ones: Tab 3. All of the 1,4-dioxane chlorinated products with fewer than 7 halogen atoms proved to be inactive. The same also applies for the Cl- and F-substituted 1,4-dioxenes and 1,4 dioxadienes, whose spatial structures differ substantially from the saturated forms.In collaboration with the Crop Protection Dept, Farbwerke HOECHST, most of the halo compounds listed in tab 1 and 2 were tested for insecticidal, fungicidal and acaricidal activity in field trials over several years, but unfortunately without positive results.These investigations were only possible because HOECHST prepared 7 kg of heptachloro-1,4-dioxane and 2.5 kg of 2,3,5,5,6,6-hexachloro-1,4-dioxene-(2) according to our instructions in its Technikum in 1951. The latter compound was obtained elegantly from heptachlorodioxanes and served as the starting material for getting into the chemistry of the said flourinated chloro-dioxanes, -dioxenes and dioxadienes. 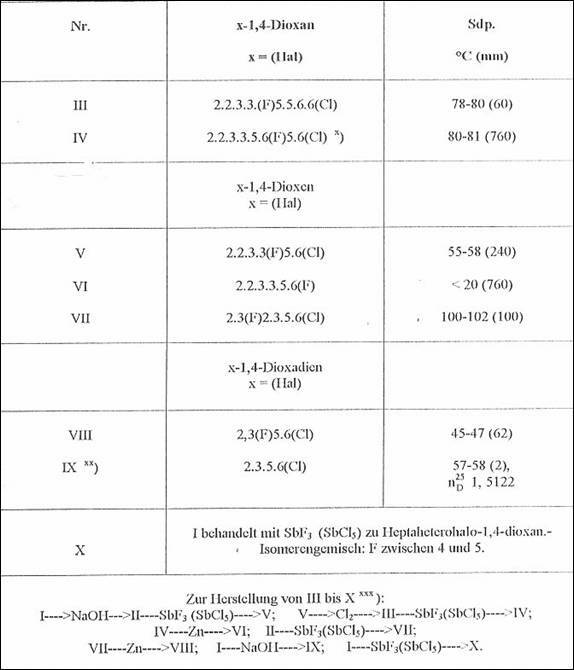 Many thanks for sending your manuscript (secreted for Farbwerke Hoechst) with the results of "Chlorination and flourination of dioxane", including 2 tables: 10 isolated Cl-substituted 1,4-dioxanes and -dioxenes (1947-49) and F- and Cl-substituted 1,4-dioxanes, -dioxenes and -dioxadienes, starting from heptachloro-1,4-dioxane (I) from melting point 56-57oC and hexachloro-1,4-dioxene (II) from melting point 20-22oC (1951-53). Please send, if possible, 50 mg each of some of the products. We have already received larger quantities of I from you for animal tests. Confidentiality with respect to the manuscript assured. I hope that my German from my Heidelberg days is still good. Lecture, given at the chemical colloquium of the central institute of UFSM in July 1971. (Scientific Pest Control) Kyoto University, Kyoto, Japan.